A statement made by a user under a news article claims that 50 % of all taxes are paid by 'rich people' being defined as making more than 70.000 €/a. 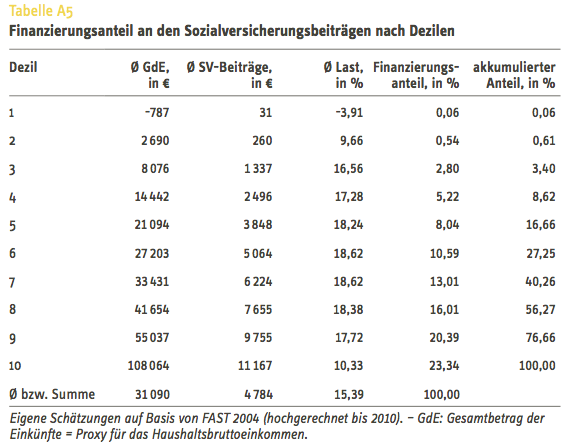 2% of "the rich" pay 50% of the taxes in Germany. Can this be backed up? Not true for "taxes", not even true for "income tax" alone. 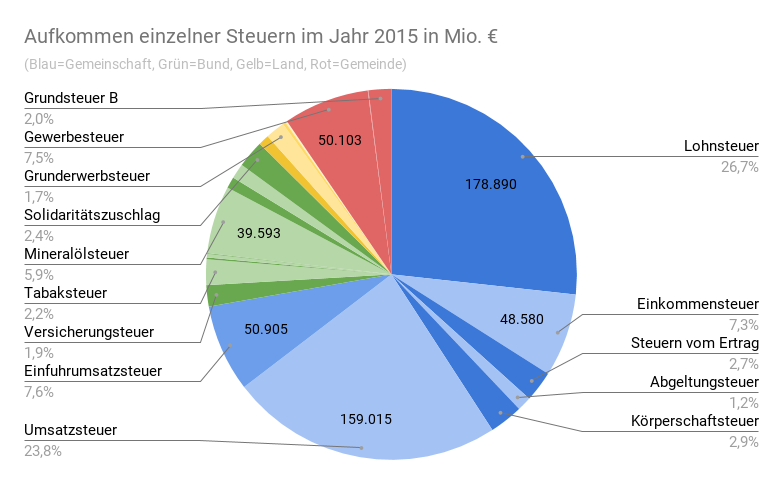 According to the official government statistics for the year 2014 –– and include those a bit more who are not really considered "rich earners" with "just" making over 125.000 EUR –– we arrive at: the top 3% of earners were paying 20.3% of overall revenues from income tax in 2014. From 250.000 upwards we have only 0.6% of all taxpayers left in that bracket paying 9.9%. What is in the claim? As written (2 % of 'the rich' pay 50 % of taxes in Germany) this is not true no matter how you spin it. The top 10% of income earners do pay a substantial amount in taxes, true. But that is by far not the whole story to it. Their share in carrying the state finances as a whole is much smaller than this number implies and the actual burden put on their shoulders is even quite low. There are quite a number of ways to legitimately try to look at this problem, circumnavigating the inherent weaknesses of several statistics available, unavailable, studies inferring those missing variables and combining them into several sets. It's still in the eye of the beholder, most of the time. Only this oversimplification will seldom appear as a correct solution to most questions. The big chunk at the bottom is VAT, a flat tax for everyone. And what is the claim actually referring to? If 2% of people cashed in 50% of all the wealth, money and income generated, then the result of 2% paying 50% of the taxes sounds almost like a perfect system? Only that the claim makes it sound nearly scandalous and has no frame of reference. Even generously taking into consideration all those possible frames not mentioned in the claim into the analysis in trying to approach a favourable outcome for the claim, that will just not materialise. Simply put: The rich pay less overall taxes than to be expected, and the highest percentiles in yearly earnings do not contribute that much to the overall income tax revenue that the claim asserts. The statistics just don't give that result from the claim. This is right-wing spin, often repeated. But usually this is claimed with a bit more precision. 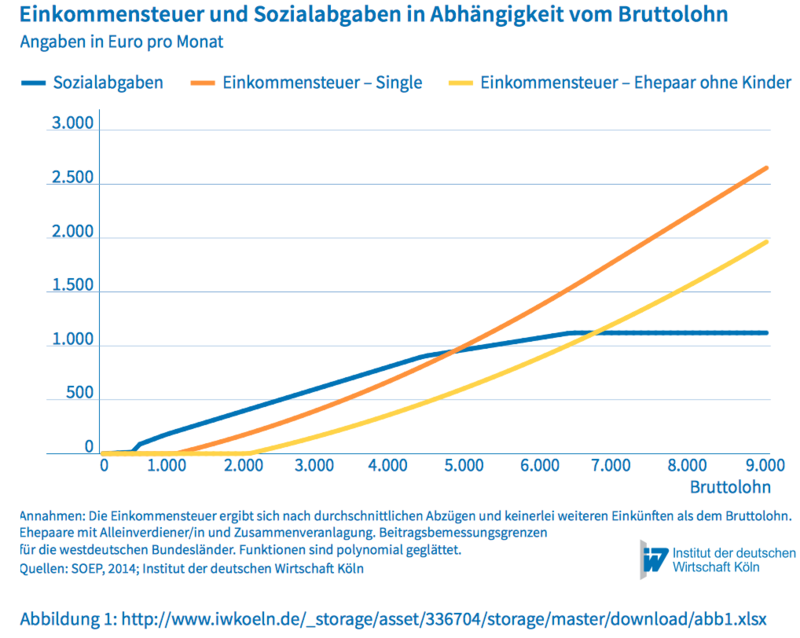 Like "10 % of 'the rich' pay 50 % of the overall income taxes in Germany" or the like. But even that is only marginally better and almost never backed up by anything. To put a comment from under the question on its feet: But the claim is indeed about tax policy, it is about "hey, we rich pay all the taxes, so shut up about inequality", "and lower the taxes already"… –– Who carries the weight, who can carry how much? And the details of these statics can be interpreted in more than one way. Drawing from the right leaning Stefan Bach, Martin Beznoska, Viktor Steiner: "Wer trägt die Steuerlast in Deutschland? 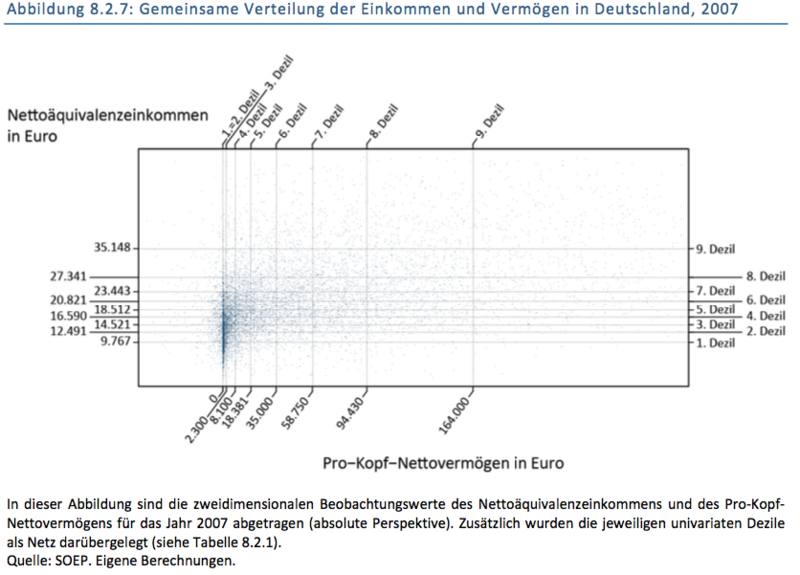 –– Verteilungswirkungen des deutschen Steuer- und Transfersystems", Deutsches Institut für Wirtschaftsforschung, 2016. Data in this study is based on several different years between 2008 and 2016. The use of household equivalent income already distorts the findings as "rich" is an accumulated measurement not accessible by German statistics and the measure chosen only tackles gains, officially registered gains. We see that the top 10% earners receive 38.5% of all earnings without transfers (p40). We see that the lowest 10% of earners contribute 0% to income tax. We see for 2015 that the top 10% of earners cash in 26% of all generated and registered income, and the same bracket contributed 34.1% of all direct taxes but only 29.3% when it comes to "taxes and social security". The top 1% of earners cashed in 5.2% of all registered income and payed 8.5% of all taxes and 5.1% of all taxes and social transfers collected (p51). Another interesting tidbit is found in income from capital like dividends. The top 10% get 90% of all capital income, from that group the top 1% alone cash in 81.2% of all dividends and the top 0.1% of the richest earners alone siphon up 60.8% of all dividends (p57). Naturally any tax from this kind of wealth simply does not apply at all to the lower classes. 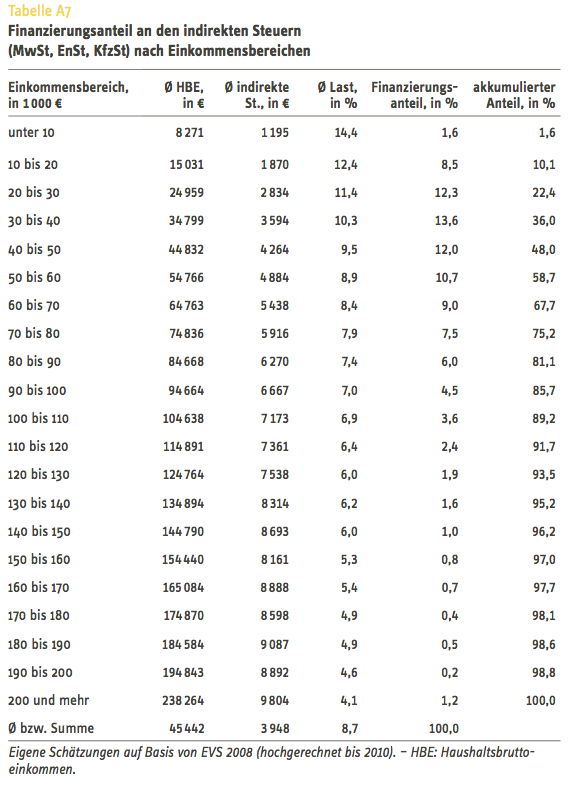 Some of these measurements are based not on actual hard data but inferred calculations and assumptions. The most important distinction to observe here is that the spectrum was analysed using deciles of household equivalence income. That means that the income bracket "the top 10%" in the last few paragraphs do not represent 10% of all people paying taxes –– but a much smaller number of taxpayers whose actual number is not inferable from the report alone. Looking from another angle, we see that the lowest 5% had to give up 19.5% of all the money they had to the state in the form of indirect taxes. While the top 1% only burdened their registered money with 5.7% (p53). Another spin on the claim would be the "top 50 percent pay 95 percent of the tax" like Bild newspaper did some time ago. Or like the FAZ did with "10 Prozent zahlen 50 Prozent". Even if that claim is really just about the income tax, without making it explicit, is that actually true, too? Then the answer is quite clearly: no. But what percentage do the rich pay? Unfortunately, this cannot be calculated in a simple manner and there are no official statistics to be read with a clear answer. Fortunately we have the Rheinisch-Westfälisches Institut für Wirtschaftsforschung e.V. (RWI). The researchers have looked at an extensive study from the year 2011. The top 50 percent actually pay in income tax 95 percent of the total. But that's not the only tax. For the main indirect taxes – VAT, car tax and energy tax – the proportion of the top 50% of households drops to 69 percent. Now it goes on. The total tax revenue from wage and income tax amounted to 186 billion euros. The Revenue from VAT (excluding import VAT) as well as value added tax and car tax amounts to 189 billion euros. Makes a total of 375 billion euros. That means then: The top 50 percent pay a total of 81 percent of the tax revenue. The calculation: 95 percent of 186 billion is 176 billion and 69 percent of 189 billion results in 130 billion. That makes up 306 billion euros. And that's 81 percent of 375 billion euros. (Strictly speaking, an aggregation is problematic for reasons of data material but it is an approximation here). Social security contributions are not even included in this calculation, but the picture is not likely to change significantly. One important thing to consider: Is that really much or little? It sounds like much or a very great amount. But: it depends on what relation the tax burden is to income. If – an extreme case – the poor do not make money, they cannot contribute to the financing of the State either. 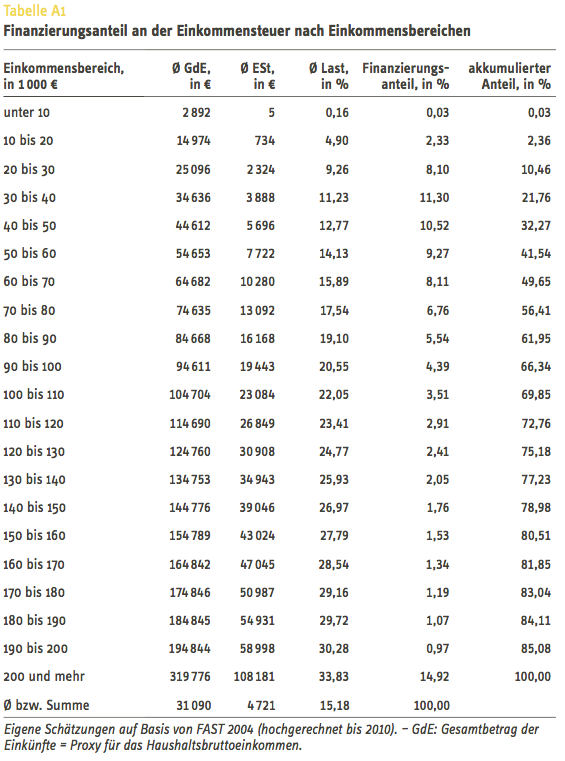 The top 50 percent united now around 80 percent of the total income. So one could say that 80 percent of the income also bear 80 percent of the tax burden. Somehow it doesn't sound like the rich fleeced. On the contary. The lowest economic part cannot contribute much from the start. The highest earners profit from flat taxes like VAT and have many possibilities for legal tax avoidance. Plus illegal tax evasion. If the topic is taxes, social security financing has to be included, even if it is not legally defined as a tax, it is one in effect. Then the picture changes drastically. In terms of load and in terms of absolute value the middle part contributes much more than the claims about rich people paying almost all implies. "The rich" can or could pay much more, as they are much less effected from such a burden. The changes in laws in the last 25 years were almost exclusively to lower the burden on the rich. 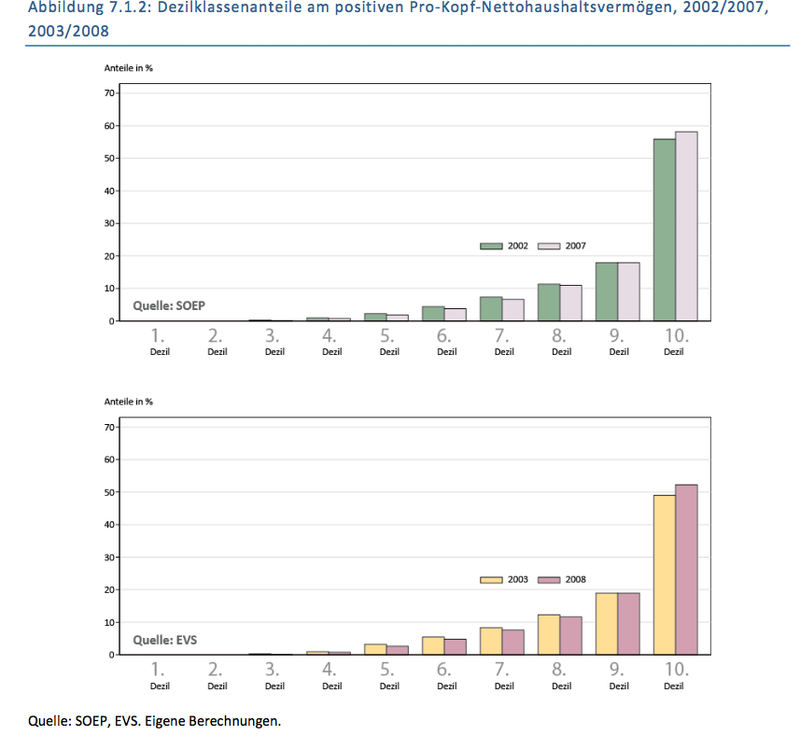 Source: Boris Beimann, Rainer Kambeck, Tanja Kasten and Lars-H. Siemers: "Wer trägt den Staat? 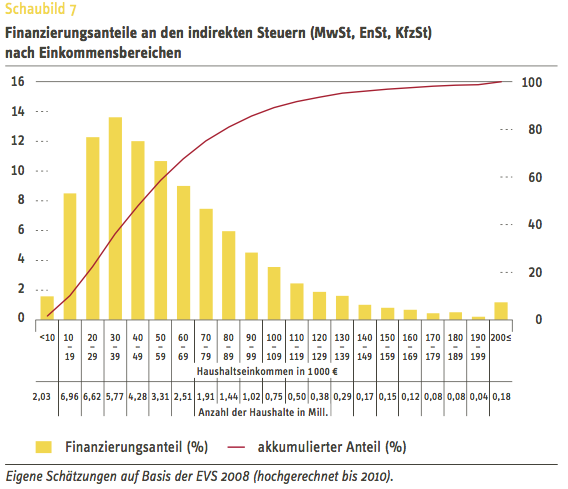 Eine Analyse von Steuer- und Abgabenlasten", RWI Position #43 vom 1. April 2011. 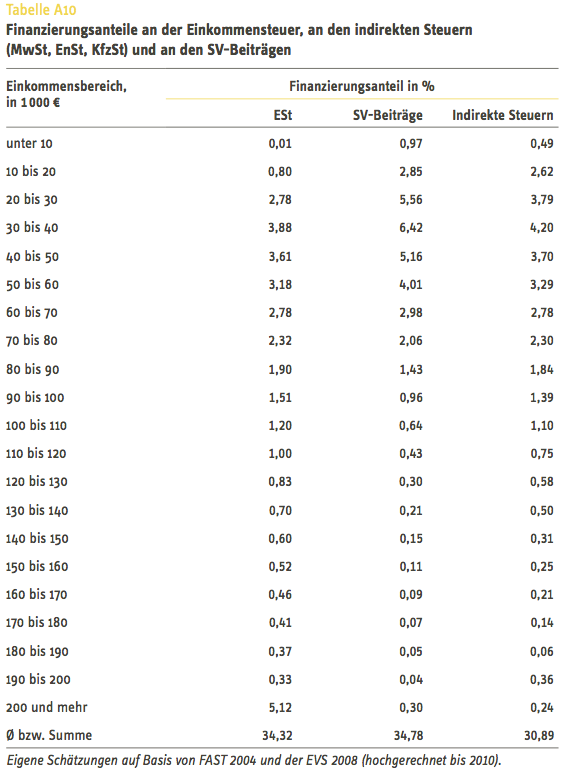 Take a close look at the first table (Tabelle A1) from that report. 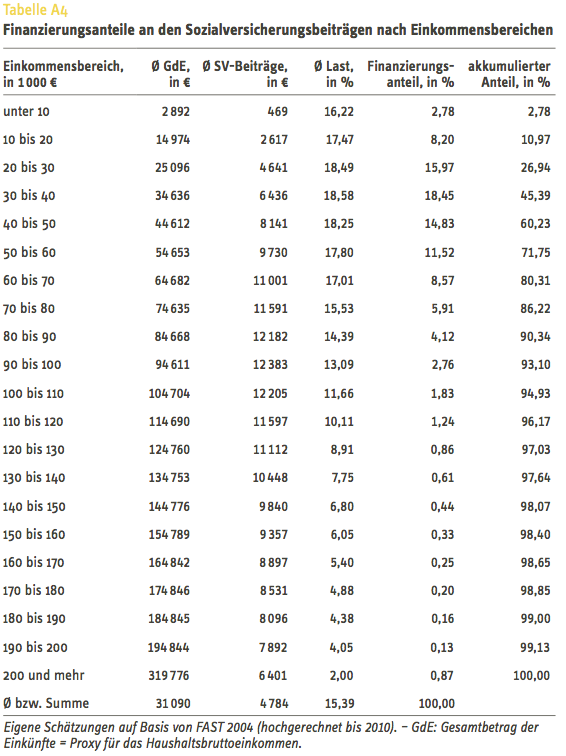 According to that calculation the top earners above 200.000 EUR a year account for a 14.92% share in total income tax revenue. The next table groups earners into deciles and concludes that the top ten percent share 54% of total income tax revenue. This measurement comes closest to the claim for income tax alone without being anywhere near the exaggerated simplification from that claim. Keep in mind that wage tax is not the same as income tax. The rich pay income tax, the not-rich wage tax. First bar is income tax, second bar is wage tax (pleae excuse this gross oversimplification). From 250000 upwards we have 0.6% of all taxpayers in that bracket paying 9.9%. If we add that up to the fourth line to include those a bit more who are not really considered "rich earners" we arrive at: the highest 3% of earners were paying 20.3% of overall revenues from income tax in 2014. One important addition to all of the above is that "rich" usually means "being rich", not "earning much". Income and wage taxes simply do not tackle richness at all, but earnings. 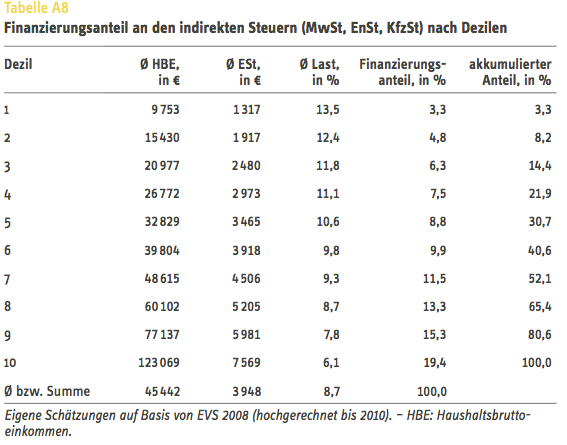 There is no wealth tax in Germany. In the second graphic the solid line is income, the dotted line is wealth. Notice the different scales and how impractically skewed to even display that graphic would look like if there was just one y-axis! 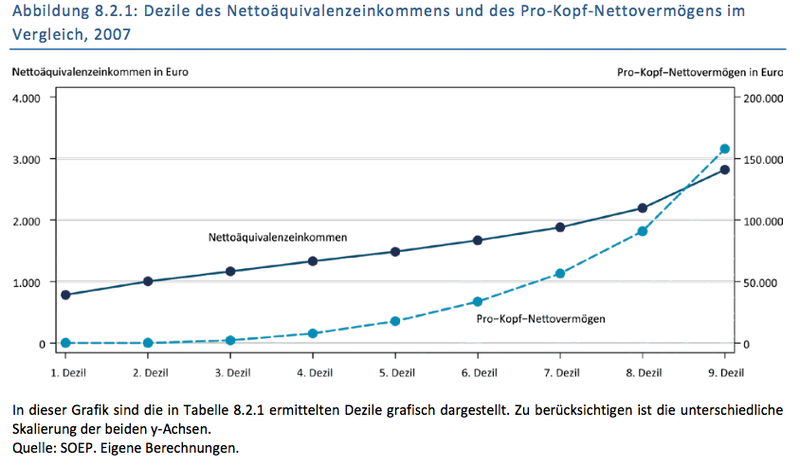 People with more than 37 500 € per year paid 80% of the income tax, while people with less than 23 000 € paid 4%. So no, not even close. Not the answer you're looking for? 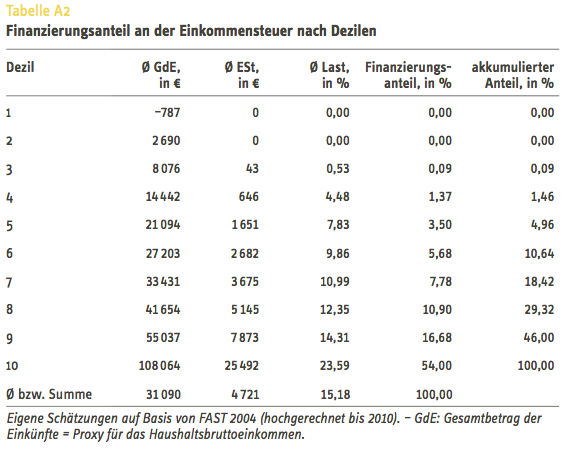 Browse other questions tagged germany taxes statistics wealth .